From time to time we receive questions regarding the history of the Triangle Squares, which sometimes are difficult to answer. Therefore we decided to write down a short history here, so that interesting details won&apos;t get lost. If you have ideas for improvements or additions, please tell us! The founding assembly decides on the first statutes. The club has 27 founding members, the seat of the club is Haan. Joachim Rühenbeck and Thorsten Hubmann are elected as club callers. The first club night takes place, A1 is danced. The Triangle Squares become a member of the EAASDC. The General Assembly of Members decides to transfer the seat of the club from Haan to Solingen. Edith Heitger is elected as a further club caller. 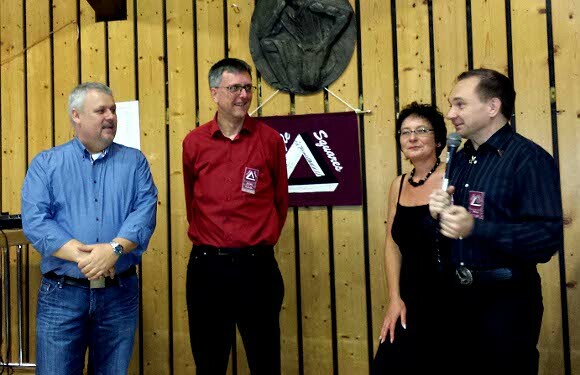 At this year's club weekend in Olpe the Triangle Squares celebrate their 10th anniversary. Paul Bristow and Dave Wilson are invited as guest callers. Ute Hanke resigns from the position of president at her own request after a term of 13 years and is appointed the first honorary member of the Triangle Squares by the general meeting. The general meeting elects Anders Blom as a further club caller. Thorsten Hubmann is organizing for the last time a club night as a club caller of the Triangles. For professional and family reasons, he resigns from his position as a club caller. At this year's club weekend, which is also the first dance weekend in Siegen, the Triangle Squares celebrate their 20th anniversary. Michael Kellogg is invited as a guest caller. Quite often we were asked: "When was the first Olpe weekend?" or "How many Olpe weekends have been there?" These questions are not easily to answer. On the one hand, because the first two dance weekends which were held in the style of the later Olpe dance weekends, did not actually take place in Olpe, but in Schloss Eringerfeld. And on the other hand, also the first dance weekend in Olpe had a little catch: The Triangle Squares did not yet exist at that time, and the weekend was "Hosted by Crossing Swords". The first "real" weekend, that means held by Triangle Squares e.V. which acutally took place in Olpe, was the A2 dance weekend on November 10 - 12, 1995 with Christer Bern und Joachim Rühenbeck. And how many weekends took place already?